We understand the importance for your child to have a bedroom that is kitted out with both practical and and stimulating items. You want to create an environment that encourages them to enjoy and cherish their own space, but also creating a environment that is functional for sleep. For girls it may be that you want to create space that they can grow into and enjoy through out their teenage years too. First things first everybody has their own distinct style - even your 5 year old. Encourage your child to help you pick out the decor of their new bedroom, and let them have some input into their bedroom furniture and new bed. The first thing that comes to a lot of peoples minds when they think of decor for a girls bedroom is "pink". Although pink does look beautiful in many bedrooms, it's important to remember that everybody has different preferences. Other colour schemes that will work wonders in a girls bedroom could be pastels such as blue, lilac, and orange. Feature walls in bold colours would also look great; think white walls with a bright pink, purple or orange feature wall. Other ways to spruce up the decor of a girls bedroom could be to add some exciting wall stickers, get your little one involved and ask them to pick out their favourite stickers. 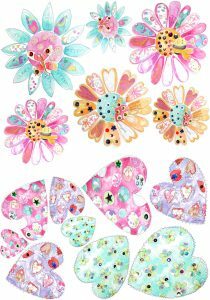 Wall stickers can come in a variety of themes and colours, such as fairy themed wall stickers or flowers and heart themed stickers. Adding accessories to a girls bedroom is an important way to make the bedroom feel more personal. Adding a few cushions to the bed that your little one will love will create a cosy and comfortable environment. 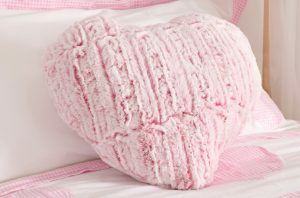 Throw cushions that match the decor of the room are ideal, or try adding these heart cushions from our range or even this beautiful fairy themed cushion. Adding bunting around the bedroom will create extra dimensions and will certainly add some depth and style to a decor that may be a little plain. Adding a door plaque to the bedroom door will also help to personalise your children's bedroom and really make it "theirs". Other items to think about are hanging organisers or memo boards for your child to use time and time again as they get older. Adding small items around the bedroom that your child will enjoy using and looking at will create an environment that your child will enjoy spending time in. Whichever decor or theme you chose for a girls bedroom, it's important to remember that everybody is individual and has their own style - make sure you get your little one involved to make (reasonable!) suggestions to how they would like their room decorating.